Based on popularity. The tier list is based exclusively on the popularity of a hero in ranked games. The win rate is considered only to determine the most outstanding heroes in a particular tier. No pro data. The performance of a hero when used by pro players and teams doesn’t influence the tiers. General and rank-based meta. The best picks at GrandMaster can differ a lot from the ones at Gold, so I produced both a general ranked tier list and many rank-based ones to point out the meta differences in each rank. Only PC. This list includes no data from console. Unfortunately, Blizzard has not released an Overwatch API to access the data of all players in the game, so this list displays no official info. There are several websites that gather data from their users, and I decided to utilize the statistics provided by Overbuff as it is the most popular one. Not long ago, Jeff Kaplan shared the official data on season 9, and the figures were mostly similar to the ones available on Overbuff. Even if the data isn’t perfect, we can trust it. Unfortunately, the recent Torbjorn rework didn’t turn him into a popular meta hero. You know how much I love our Swedish engineer, and even if I believe his usefulness and adaptability have been drastically improved, it is still very hard to justify his presence in most lineups. I have explained the situation of Mercy and Ana in the August Meta Report. The adjustments that affected them in the past months brought to the rise of the healer with the highest skill requirements in the game: Ana. Mercy is still a predominant pick at lower ranks, but even if recently Blizzard slightly buffed her by reducing the ultimate cost and increasing the healing per second from 50 to 60, she isn’t tier 1 material anymore (or even tier 2), so most experienced players migrated onto other heroes. Note: If you would like to know all the updates that affected a specific hero over time, I am maintaining an account of all the hero balance changes, and two lists on the PTR and Live client patch notes released in 2018. There are almost no differences between the top 10 most popular heroes by rank in October and November. In particular, the most picked ones at GrandMaster are exactly the same, and with a very similar order. The only exceptions are Brigitte - who surpassed Zenyatta - and Lucio, which pick rate increased from 6.2% to 8.2%. In the October Meta Report, I have explained in detail the GOATS composition and gameplay, how to counter it, and the differences with Dive. A month later, the Deathball lineups are still dominating the game. Even if from our data the hero distribution in pub games is still the same, pro players are constantly testing new compositions. We are witnessing more variants of the original GOATS: for example, some teams are trying Mei in place of D.Va or Brigitte. I believe the popularity of the latter might drop once the changes of the PTR will reach the Live client. The Shield Bash damage has been decreased from 50 to 5, so now the damage potential of her stun combo is weaker. The developers must act after the recent complaints voiced by some figures of the community (more info in the GrandMaster section). Tier 1 (>10%): Reinhardt 12.1% - Ana 10.2%. Tier 2 (>7%): Moira 7.5%. Tier 3 (>4%): Zarya 6.5% - D.Va 5.6% - Mercy 4.9% - Genji 4.7% - Lucio 4.2% - McCree 4.1%. Tier 4 (>2%): Zenyatta 3.8% - Brigitte 3.8% - Hanzo 3.6% - Doomfist 3.1% - Winston 2.9% - Roadhog 2.8% - Widowmaker 2.8% - Pharah 2.5% - Junkrat 2.1%. Tier 5 (<2%): Soldier 76: 1.9% - Reaper 1.8% - Orisa 1.7% - Tracer 1.6% - Wrecking Ball 1.6% - Torbjorn 1.3% - Mei 1.0% - Sombra 1.0% - Symmetra 0.7% - Bastion 0.4%. Symmetra is still included among the supports because of the statistical tool used for this tier list. Removing her would have caused problems with the data. Tier 1 (>10%): Ana 15.1% - Reinhardt 10.3%. Tier 2 (>7%): Zarya 9.2% - Lucio 8.2% - D.Va 7.0%. Tier 3 (>4%): Winston 5.7% - Brigitte 5.3% - Zenyatta 5.0% - Genji 4.8% - Widowmaker 4.1% - Doomfist 4.0% - Hanzo 4.0%. Tier 4 (>2%): McCree 2.8% - Tracer 2.6% - Wrecking Ball 2.0%. Tier 5 (<2%): Sombra 1.8% - Roadhog 1.4% - Orisa 1.2% - Moira 1.1% - Mercy 1.0% - Torbjorn 0.7% - Mei 0.7% - Pharah 0.6% - Symmetra 0.4% - Soldier: 76 0.4% - Junkrat 0.4% - Reaper 0.2% - Bastion 0.1%. A few weeks ago, Brandon “Seagull” Larned (former pro player for Dallas Fuel; currently streamer) explained the present state of the game in a video that has been reshared by hundreds of thousands of players. If you missed it, I have summarized the main points. Winston must jump on Ana to deal with her, but she has a defensive tool at her disposal, Sleep Dart. He must predict its usage and activate Barrier Projector at the right time to block the dart. The skill of the player is fundamental for the outcome of the fight. Seagull believes that at the moment the game is stuck in a rock-paper-scissors situation. Imagine having a spreadsheet with all the heroes and compositions in the game: you know exactly what you must pick to counter a certain hero or lineup, and if you do not accept to swap hero or role, you will end losing the game because the disadvantage is excessive. More: check out our Hero Counter List. The Brigitte versus Tracer matchup shows what’s the problem. Even if Tracer is a high-skilled player able to dodge all the stuns and attacks, Brigitte still counters her just by existing due to the passive armor, the AoE heal, and the ability to zone her out with the minimum effort. The hard counters destroyed the game because your gameplay and skills do not matter anymore: everything is decided at the pick screen. According to Seagull, the game is frustrating: “good games are really good and bad games are really bad”. The developers must find a way to normalize the experience of the players because now it is out of your control and mostly depends on luck. The hard counters create a horrible experience in competitive play because the teams are forced to swap heroes if they want to have the upper hand against the opponents. For example, if the enemy team is using a Deathball composition (GOATS in particular) with three tanks and three supports, and you do not have Sombra or Doomfist as DPS, you either mirror or you lose. Note: we use the term “mirror” when both teams run the same strategy; often with exactly the same heroes. In pub games (even at high ranks) not everyone is able to play all the heroes in a certain role, and some are not willing to adapt and change their pick, so you end having a very unpleasant game experience. This situation promotes toxicity inside the team because the players will start blaming each other, asking to change hero or playing in a certain way. The situation degenerates, you get frustrated, and the team loses or even gives up on the match. He also points out the problem with Crowd Control abilities in a game like Overwatch. Heroes such as Sombra, Doomfist, Brigitte, and Hammond are very annoying to play against because you can’t counterplay them yourself, but you have to rely on the team. Of course, this isn’t an issue in pro play, but the game must be balanced also for pubs where any communication with the teammates is very difficult to achieve. The Dive meta dominated the professional scene for about a year and a half, but this strategy was well-executed only by pro or experienced players. Of course, the developers had to stop it, so they added Brigitte to the game. Seagull affirms that Brigitte is a very easy hero to play, she is reliable, has a CC ability, and can be considered a noob-stomper. Brigitte helped to shape a new meta, the Deathball one. If compared to Dive, the strategy promoted by GOATS is quite easy to reproduce even by average players in solo queue, so in ladder you must be ready to react against it. He concludes that eliminating Dive brought to the actual frustrating experience in solo queue with Brigitte. A week before this video, Jørgen “Decod” Myrlund (a pro player who recently played with Last Night’s Leftovers) tweeted that it doesn’t matter what people think about Brigitte; she is necessary to stop the Dive meta. Daniel “dhaK” Martínez (former support for San Francisco Shock during OWL Season 1) pointed out that there must be a way to make her viable without being so annoying. I think we need to increase her skill requirements. We must preserve her role as a counter for flankers, but the average Brigitte player should not be able to perform optimally even with almost no skill-management. We should maintain the same skill floor, but increase the skill ceiling (easy to say, but hard to implement :P). From my experiences with developers, feedback along the lines of "This makes me feel this way" is generally more constructive and useful to them than offering solutions. I don't really know what the "fix" is and I'd rather keep it at that. Balancing a game as complex as Overwatch requires professionals and a lot of work. We are the audience, so we can understand the problems in the gameplay we are experiencing, but we do not possess the knowledge to find a solution. For example, we can’t just ask to remove completely any stun from the game because it would have a huge impact on both the pub and pro meta. Lane “Surefour” Roberts, DPS player for Los Angeles Gladiators, explained his thoughts on the solo queue gameplay. He points out that independently from rank, skill, and behaviour, eventually everyone will get frustrated in solo queue. We try our best to achieve victory, but when things go dire, we believe that our teammates are not doing enough to win the match. Some people end hating the team-oriented gameplay of Overwatch, and would like carrying the game on their own. Surefour asks how we can give them this power. If we buff the DPS heroes and give highly mechanical players the ability to determine the fate of the match, we will ruin completely the balance of the game. Tanks and supports will become secondary as their impact won’t be enough to stop the DPS, which will be able to do whatever they want. Also the tanks may ask more power because sometimes they just feel used and abused, so we give them more damage. The DPS heroes would become totally powerless against the mighty tanks. The support players will start complaining as well because they have problems surviving on their own and receive no help from the team. If we buff them, both the tank and the DPS players won’t be able to kill them anymore. In short, Surefour tells us that Overwatch is a team game, and we can’t expect to carry a game on our own, 1vs6. It is completely normal that one of more weak players in our team will affect the overall gameplay, and this is why you must understand what’s your role in the team and what you should do to help the team win. Solo carrying in Overwatch is almost impossible because we talk about a 6vs6 role-based game. Tier 1 (>10%): Ana 14.4% - Reinhardt 11.6%. Tier 2 (>7%): Zarya 8.9%. Tier 3 (>4%): Genji 6.3% - Lucio 5.8% - Zenyatta 4.7% - D.Va 4.6% - Brigitte 4.5% - Winston 4.5% - Hanzo 4.2% - Doomfist 4.0%. Tier 4 (>2%): McCree 3.9% - Widowmaker 3.7% - Moira 3.0% - Tracer 2.5% - Roadhog 2.1%. Tier 5 (<2%): Mercy 1.9% - Wrecking Ball 1.8% - Sombra 1.4% - Orisa 1.1% - Pharah 1.1% - Torbjorn 1.0% - Mei 0.8% - Soldier: 76 0.7% - Symmetra 0.5% - Junkrat 0.5% - Reaper 0.4% - Bastion 0.1%. Tier 1 (>10%): Ana 12.4% - Reinhardt 12.2%. Tier 2 (>7%): Zarya 8.3%. Tier 3 (>4%): Genji 6.2% - Moira 5.4% - McCree 4.8% - Zenyatta 4.5% - Lucio 4.2% - D.Va 4.1% - Hanzo 4.1%. Tier 4 (>2%): Brigitte 3.9% - Doomfist 3.9% - Widowmaker 3.6% - Winston 3.3% - Mercy 2.9% - Roadhog 2.7% - Tracer 2.2%. Tier 5 (<2%): Pharah 1.7% - Wrecking Ball 1.7% - Sombra 1.2% - Soldier: 76 1.2% - Orisa 1.2% - Torbjorn 1.1% - Reaper 1.0% - Junkrat 0.9% - Mei 0.8% - Symmetra 0.5% - Bastion 0.2%. Tier 1 (>10%): Reinhardt 12.5% - Ana 10.8%. Tier 2 (>7%): Moira 7.4% - Zarya 7.0%. Tier 3 (>4%): Genji 5.0% - D.Va 4.9% - McCree 4.7% - Mercy 4.3%. Tier 4 (>2%): Zenyatta 3.9% - Hanzo 3.8% - Brigitte 3.7% - Lucio 3.6% - Doomfist 3.3% - Roadhog 3.1% - Widowmaker 2.9% - Winston 2.8% - Pharah 2.5%. Tier 5 (<2%): Soldier: 76 1.8% - Reaper 1.7% - Tracer 1.7% - Junkrat 1.6% - Wrecking Ball 1.6% - Orisa 1.4% - Torbjorn 1.2% - Sombra 1.0% - Mei 1.0% - Symmetra 0.6% - Bastion 0.3%. Tier 1 (>10%): Reinhardt 12.4%. Tier 2 (>7%): Moira 9.1% - Ana 8.8%. 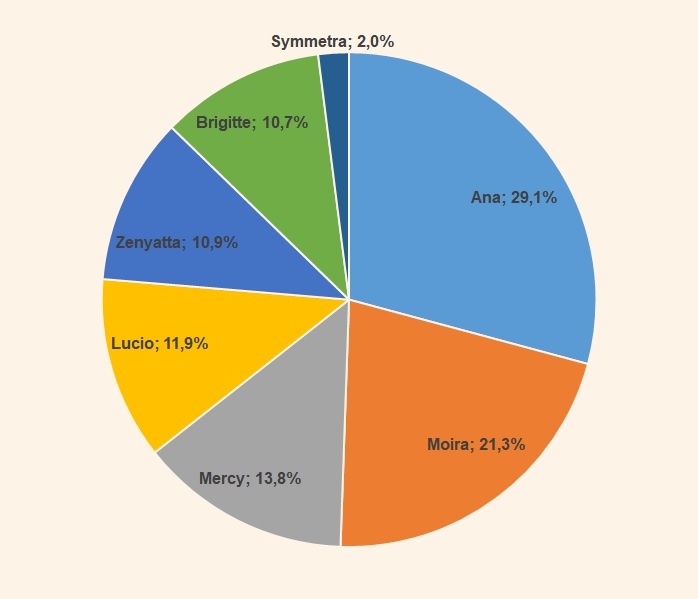 Tier 3 (>4%): D.Va 6.2% - Mercy 6.2% - Zarya 5.5%. Tier 4 (>2%): Lucio 3.9% - Genji 3.8% - McCree 3.8% - Brigitte 3.6% - Zenyatta 3.4% - Hanzo 3.3% - Pharah 3.1% - Roadhog 2.9% - Junkrat 2.8% - Doomfist 2.6% - Winston 2.5% - Reaper 2.4% - Soldier: 76 2.3% - Widowmaker 2.2%. Tier 5 (<2%): Orisa 1.9% - Wrecking Ball 1.5% - Torbjorn 1.3% - Tracer 1.3% - Mei 1.1% - 0.8% - Symmetra 0.8% - Bastion 0.4%. Tier 1 (>10%): Reinhardt 11.2%. Tier 2 (>7%): Moira 9.9% - D.Va 7.5% - Mercy 7.3% - Ana 7.1%. Tier 3 (>4%): Lucio 4.7% - Zarya 4.2% - Junkrat 4.1%. Tier 4 (>2%): Brigitte 3.7% - Genji 3.2% - Zenyatta 3.2% - Pharah 3.0% - Hanzo 3.0% - McCree 2.9% - Roadhog 2.7% - Orisa 2.7% - Reaper 2.6% - Soldier: 76 2.6% - Winston 2.3% - Doomfist 2.2%. Tier 5 (<2%): Widowmaker 1.8% - Torbjorn 1.6% - Wrecking Ball 1.5% - Mei 1.4% - Tracer 1.1% - Symmetra 1.0% - Sombra 0.9% - Bastion 0.7%. Tier 1 (>10%): Reinhardt 10.0%. Tier 2 (>7%): Moira 9.6% - D.Va 8.4% - Mercy 7.7%. Tier 3 (>4%): Ana 5.7% - Lucio 5.3% - Junkrat 4.5. Tier 4 (>2%): Orisa 3.8% - Brigitte 3.4% - Genji 3.3% - Zenyatta 3.1% - Zarya 2.9% - Pharah 2.8% - Hanzo 2.8% - Roadhog 2.6% - Soldier: 76 2.5% - Torbjorn 2.4% - Widowmaker 2.3% - Reaper 2.2% - McCree 2.1% - Doomfist 2.1% - Winston 2.0%. Tier 5 (<2%): Mei 1.7% - Tracer 1.5% - Wrecking Ball 1.5% - Bastion 1.5% - Bastion 1.5% - Symmetra 1.4% - Sombra 1.1%.